A castle may have existed in Clitheroe since 1102, predating the present one. This was a time of much strife in Lancashire-King William II and King Henry I (the sons of William the Conqueror), had to contend with not only keeping the native Saxons under their rule, but repeated attacks from the lowland Scots. In 1138 William fitz Duncan, the nephew of King David of Scotland, led a Scottish force into Lancashire. (See our page on the Battle of Edisford Bridge here). The defence of Lancashire was organized by the de Lacy family, and this is the family that is responsible for the building of the present castle. The castle keep that we see today, together with a fortified chapel dedicated to St. Michael were constructed in 1186. The castle is of a motte and bailey type, the outlying bailey area can still be seen, but its buildings (including the chapel) are no longer present. The castle was built on a rocky limestone outcrop. It is still quite a climb from base to the top, so we know it would be a naturally defendable position. The medieval keep that we see today is very small, the second smallest in the country. It consisted of three floors connected by a spiral staircase. The staircase is now inaccessible, but the surrounding turret and its loopholes can be seen from the outside, leading to the flagpole on top. We enter on the ground floor through some very enlarged loopholes. Before us we can immediately see an unusual inset stone area that looks somewhat like a fireplace. The ground floor would have been used for storage, and would only be accessible by a trapdoor from above. Large stone rectangular slots can clearly be seen that would have held the floor beams for the above story. 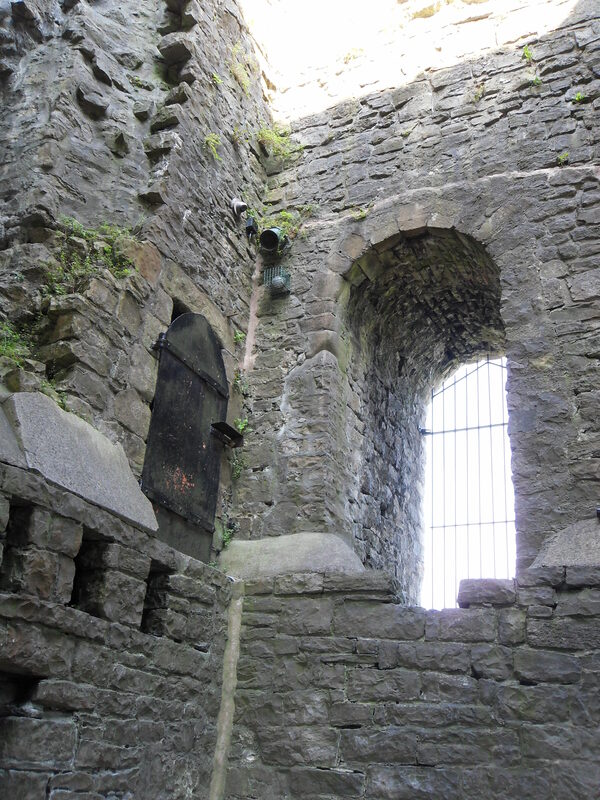 On the next floor we can see the entrance to the spiral stair case (covered by a modern door) and some impressive doorways, including the main entrance to the keep. This floor would have been the where the main activity of the keep would take place. Today many of the loopholes have been widened considerably to allow much more light into the whole building. The top floor above would have been a bedroom, and above this would have been the battlements. The curtain wall directly outside the keep is thought to be original and there are great views from this vantage point. The castle has had a part to play in both local and national history. In 1349 Whalley Abbey got control of the chapel, considerably expanding the abbey’s influence over Lancashire as the chapel had jurisdiction over areas including Clitheroe,Pendle, Rossendale, Ramsgreave,Trawden, Bowland and Hoddlesden. During the War of the Roses Henry VI was captured in Lancashire and imprisoned at the castle in 1464, before being taken to London. During the Civil War, Royalist forces under the command of Prince Rupert occupied the castle until his defeat at Marston Moor in 1644. Soon after in 1649 Parliament ordered the castle to be ruined so that it was no longer effectively defendable- a fate that happened to many strongholds throughout the country. The castle continued to be the administrative base for a large part of East Lancashire up until the early 1800s. Today, only the keep and the walls around it are all that’s left of medieval times. The buildings in the bailey grounds date from the Georgian period. In Castle House is Clitheroe Castle Museum, which has extensive displays of the geology of the area as well as the human history of the Clitheroe region, stretching from the prehistoric to the present day. The museum and castle grounds are open daily. The medieval keep and the surrounding grounds are free to visit. There is a small charge for the museum, which also has a shop, café and gallery. Parking: Clitheroe has many car parks. Just head up hill from any of them to reach the castle.